We’ve enjoyed the 2012 Sonoma Coast Pinot Noir with many different dishes but by far our favorite has been pairing this wine with a roasted rack of lamb with fresh garlic and rosemary for seasoning. For this recipe, we follow our friends at epicurious. This meal takes less than a hour to prepare and is absolutely delicious. Hands down our best pairing to date – the spice and dark red fruit in the wine is perfectly balanced by the rosemary, earth and intensity of this meal. 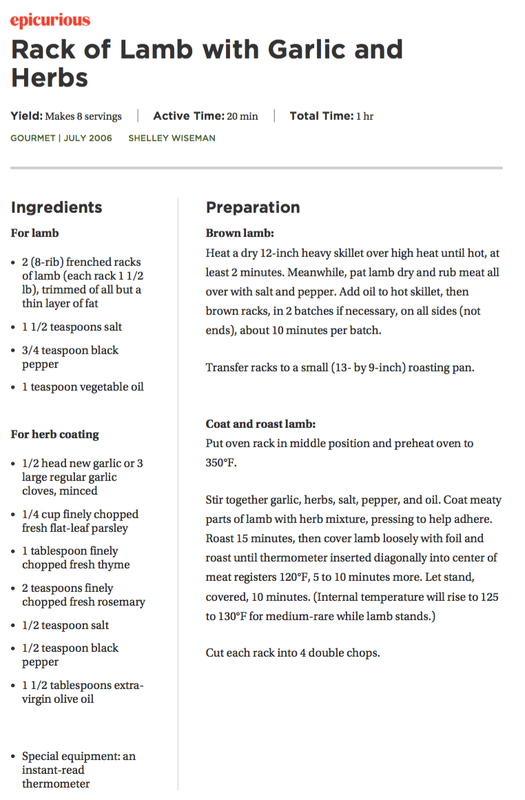 We also prefer to BBQ our rack of lamb instead of cooking it in a skillet but try both ways to see which you prefer. Here’s a toast to a great meal!